Normally, there is a connection between crummy penalty killing and crummy goaltending – but Andersen has had an excellent series against the Bruins. Been the Leafs best player. Structurally, though, down a man the Leafs don’t appear to have any reasonable answer through the first four games – more importantly Wednesday night with the Leafs having a 2-1 lead in the series and the grand opportunity to go up two games. An opportunity now blown as the series heads back to Boston for Game 5. In Game 4, Boston scored a first-period power-play goal and a second-period power-play goal and really that had the Leafs playing catchup all night long. Two power-play goals. They only had two power plays. After four games, Boston now has five power-play goals, at least one in every game. Toronto has killed penalties at a fire-the-coach rate of 54.5%. You need 80% or more to get into law school, get into medical school, get to the second round of the Stanley Cup playoffs. At below 60%, you’re getting ready to pack your bags and head home. That’s frankly inexcusable. 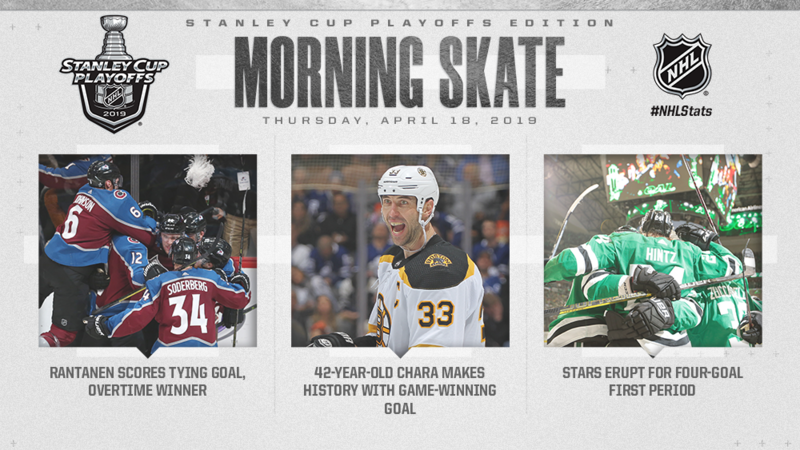 In the delirium of the green-tinted, laser-spewing, euphoria-inducing American Airlines Center on Wednesday night, the Stars authored a story of redemption. In their most important game of the season, a 5-1 win in Game 4 over Nashville that evened the first-round series at two games apiece, the Stars removed the doubt that followed them after Monday night's loss to the Predators. Redemption called Ben Bishop's name. Bishop is the Stars No. 1 goaltender, and potentially the best one in the league, maligned by an uncharacteristically leaky performance Monday night when he surrendered two soft goals in an otherwise strong game from Dallas. On Wednesday night, when coach Jim Montgomery showed faith in starting him again, Bishop responded with a 33-save victory. It was Bishop's return to the normally steady goalie he's been all year, when he led the league in save percentage and goals against average. Watch the game highlights below. The Calgary Flames have a five-alarm fire on their hands. Despite another heroic goaltending outing by Mike Smith, the Flames return to Calgary Friday facing the very real possibility another conference champion is about to bite the dust courtesy of a wild-card club. The Flames allowed a game-tying goal in the final three minutes for the second time in this series, setting up a 3-2 overtime loss and 3-1 series deficit. This time Colorado’s hero was Mikko Rantanen, scoring 9:37 into overtime to cap a late, two-goal comeback that will require even more fortitude from Calgary. Rantanen’s second goal of the game was a one-timer from long-range that beat Smith clean. It came on the Avs’ 52nd shot, mere seconds after Colorado killed off an Ian Cole delay of game penalty. Below, watch the game tying and winning goals from Rantanen plus the full game highlights. Rantanen scores game-tying goal and overtime winner; Bruins score six goals, withstand third-period Maple Leafs rally; Stars race out to 4-0 lead in first period. Series tied at two and it is now a best 2 out of 3 series. Next game is Friday night in Boston. David Pastrnak scored twice in quick succession, Brad Marchand had a goal and two assists, and the Boston Bruins survived a late Toronto surge to beat the Maple Leafs 6-4 on Wednesday and even their best-of-seven Eastern Conference quarterfinal at two games apiece. Charlie McAvoy, with a goal and an assist, Zdeno Chara and Joakim Nordstrom, into an empty net, provided the rest of the offence for Boston, which got 38 stops from Tuukka Rask. Auston Matthews, with two, Zach Hyman and Travis Dermott replied for Toronto. Frederik Andersen made 25 saves, Morgan Rielly added two assists. Toronto, Nashville and Colorado lead their series 2-1. NEW YORK (April 17, 2019) – Center Patrice Bergeron of the Boston Bruins, center Ryan O'Reilly of the St. Louis Blues and right wing Mark Stone of the Vegas Golden Knights are the three finalists for the 2018-19 Frank J. Selke Trophy, which is awarded “to the forward who best excels in the defensive aspects of the game,” the National Hockey League announced today. Members of the Professional Hockey Writers Association submitted ballots for the Selke Trophy at the conclusion of the regular season, with the top three vote-getters designated as finalists. The winner will be announced Wednesday, June 19, during the 2019 NHL Awards™ presented by Bridgestone at Mandalay Bay Resort and Casino in Las Vegas. "It’s not what people expected or figured that was going to happen with the regular season they had. It doesn’t matter what seed you’re in. Or your place. "It all comes down to will." -Auston Matthews of the Toronto Maple Leafs on the Tampa Bay Lightning being swept. The CP at Sportsnet has more reaction from the Leafs and Bruins.